Photograph from the Curzon Collection: 'Views in Meywar'', of ceiling carvings of a Jain temple in Chittore Fort, taken by Deen Dayal in c.1890. 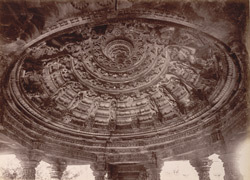 This view shows the corbelled dome with finely carved ceiling panels and bracket figures of the mandapa of the Satbis Deori Temple, or the twenty-seven shrine complex. This 15th century Jain temple is set in a walled compound and surrounded by minor shrines and consists of a sanctuary covered by a clustered tower and a mandapa, both decorated with sculptures set on the wall projections.